It’s been a while since I posted in the WTF category. Today, I had something happen that qualified. 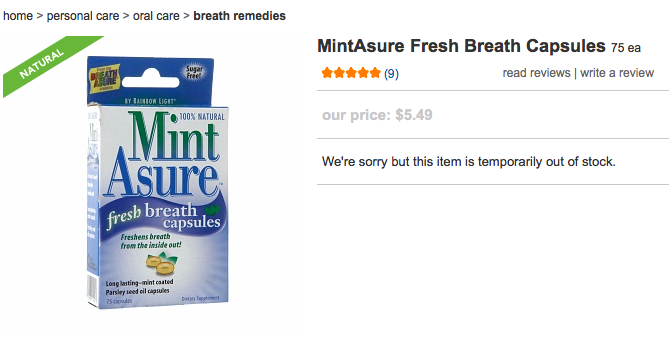 I use this product called Mint Asure. They are peppermint pills/capsules that you swallow to help give you good breath, as it releases itself down your throat and into your stomach. They work quite well and are not very much. Unfortunately, I can’t find them here in Utah. So when I run out, I make sure that I order a few boxes of them [they come in 75-ct and 160-ct packages] from an online store called drugstore.com. The image above is from the email I got today that tells me to go order more as I am actually running low. Ok. I click on the blue SHOP NOW button which takes me to the product page. …. and major disappointment… they are OUT OF STOCK. REALLY? Because you just sent me an email saying SHOP NOW. It would have been nice to have checked your stock before sending me an email. BASTARDS! I will have to check back with drugstore.com in a week or so to see if they are back in stock. In the meantime, I did find them on Amazon, but at almost double the cost. I’m not quite desperate yet. 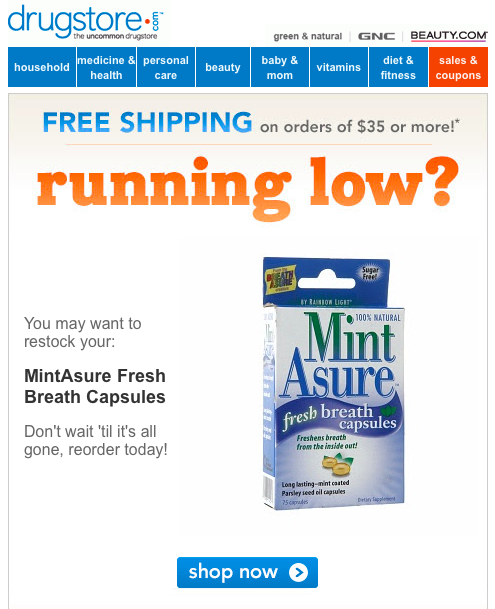 But if it comes down to only having the last 10 or so Mint Asure capsules, I might have to pull the Prime trigger. Aye yi yi. And computers are supposed to be smarter. Yeah, it uses my recent search on that item to send emails to me when it sees I didn’t order it. Totally forgetting that to check that they are out of stock. In this day and age of being able to track items, you would think they would check “out of stock” first before telling me to order it.